Sweet bread rolls are filled with cherries, chocolate and plenty of cinnamon sugar and then are topped with a crunchy streusel. 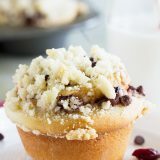 You can’t go wrong with these Chocolate Cherry Streusel Rolls! Combine the warm milk mixture, sugar and salt in the bowl of a stand mixer fitted with the paddle attachment. Add in the egg, yeast mixture and 1 cup of the flour. Beat on medium speed for 3 minutes. Gradually add more flour until you have a soft dough. Turn the dough out onto a lightly floured surface and knead until it is smooth and elastic, 6-8 minutes. Place the dough in a greased bowl, turning once, then cover and let it rise in a warm, draft-free area until doubled, about 1 hour. Punch the dough down and let it rest for 10 minutes. Roll the dough into a 12×15-inch rectangle. Spread the butter on top of the dough. In a small bowl, combine the brown sugar, cinnamon, cherries and chocolate chips. Sprinkle the filling evenly over the dough. Roll up jellyroll style. Spray a 12-cup muffin tin with non-stick cooking spray. Cut the dough into 12 equal pieces and place them in the muffin tin. In another bowl, combine the flour, sugar and butter. Use 2 forks or a pastry cutter to cut the butter in, forming coarse crumbs. Sprinkle the streusel mixture over the rolls. Cover and let rise for 30 minutes. Heat the oven to 350ºF. Bake the rolls for 20 minutes, or until they are golden brown. Let them cool for 2 minutes before removing from the pan to a cooling rack to cool completely.